This park is on the northeast side of Lafayette. Watch carefully when you are nearing it because it is easy to miss. 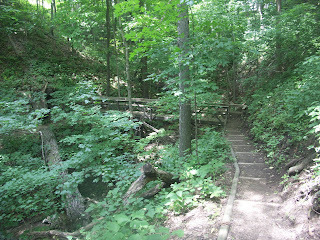 The park has several foot trails running along the banks of Wildcat Creek and on the bluffs overhead. A lot of work has been put into building scenic overlooks and shoring up trails running along the hillsides. Although much of Indiana is flat, this park gives you the opportunity to experience hilly terrain. The park is meant to preserve and reintroduce the original flora and fauna of the region and yearly controlled burns are conducted to keep a dense forest from growing and allow the native planes species to thrive.